At the moment, there is no clear indication for the use of a definite technique. It seems that the tendency has been to recommend unilateral frontotemporoparietal DC for the treatment of cerebral hemisphere injury or edema, where bifrontal DC is indicated if there is diffuse swelling. 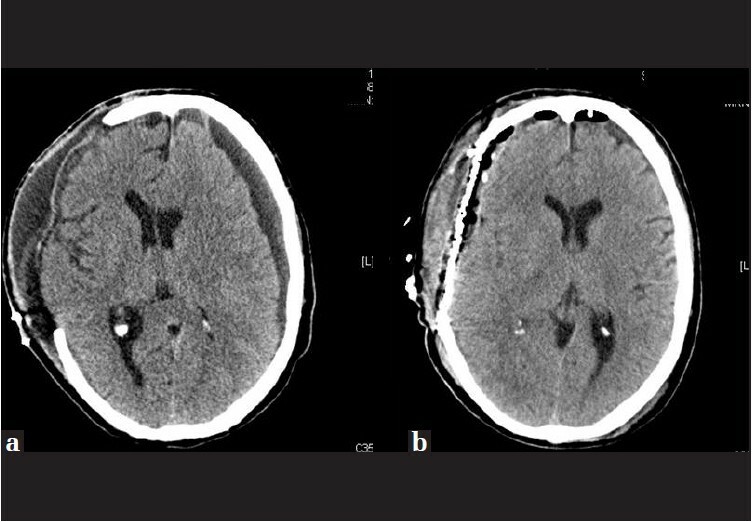 We present two cases of patients with TBI, who required DC and who suffered complications secondary to the technique. A 15-year-old female patient was admitted after a severe TBI. The axial computed tomography (CT) scan showed a frontoparietal subarachnoid hemorrhage, right frontal subdural hematoma, cerebral edema, and important bilateral uncal herniation. A wide bifrontal DC was carried out and subdural hematoma evacuation was done. Seventeen days after admission, when objectified 11 points in Glasgow Coma Score (GCS) (4-1-6), and obeying simple commands, the patient suffered a neurological deterioration to 3 points on the GCS and pupil anisocoria. 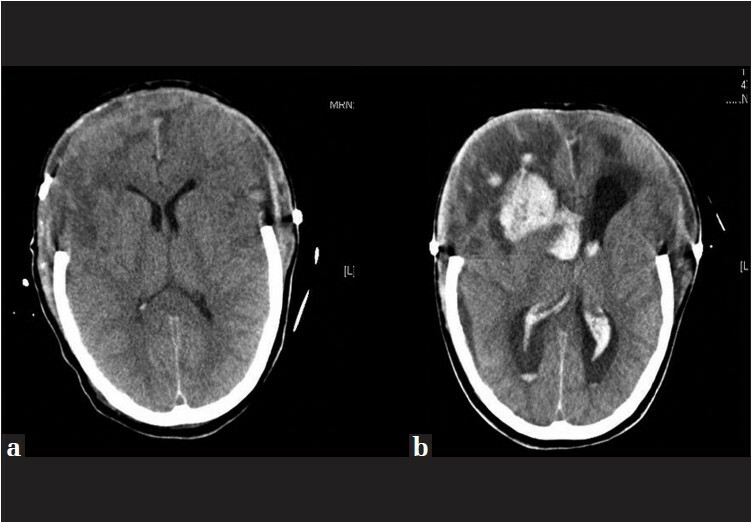 The CT scan showed that frontal intraparenchymal hemorrhagic lesions opened to the ventricular system [Figure 1]. The patient died in a state of severe brain damage, within the context of nosocomial infection, 35 days after admission. A 60-year-old man who suffered a severe TBI with a right subdural effusion, with a mass effect on the midline of 19 mm, ventricular compression on the same side, uncal and transfalcine herniation with effacement of cisterns and compression on the temporal horn, had a right frontotemporoparietal DC performed, and hematoma evacuation was done. The patient remained with 10 points (3-2-5) in the GCS, but with no connection to the environment. After 20 days of admission, a right subdural hygroma appeared, which required surgery and titanium cranioplasty [Figure 2]. The patient was discharged home with a 3-point GCS, with severe disability, conscious, but with basic family-support for daily activities, after 28 days of admission. The age and GCS of the patient are major factors influencing DC effectiveness. It is generally reported that the outcome of patients younger than 50 years or with an initial GCS score of 6 or more is significantly better than that for older patients or those with an initial GCS score lower than 6. The factor having the greatest influence on the outcome is the time from injury to surgery. Patients who undergo DC within the first four hours following trauma have a better outcome compared to those who undergo DC after four hours. Hygroma is caused due to an alteration between production and reabsorption of cerebrospinal fluid. It is relatively common and it can be developed in up to 50% of the cases. The main cause is a disruption between the dura and arachnoids, when performing the DC. Among their most common locations are the subdural, subgaleal or the interhemispheric, being more common where the craniectomy it is site. Its incidence can be reduced by performing duraplasty. It is rare that effusions present clinical expression and most of them are reabsorbed spontaneously, but when its expansion produces neurological impairment it is necessary to have an aggressive treatment such as surgical excision — cranioplasty being a definitive solution, as in the case that we have reported. The presence of interhemispheric, subdural or subgaleal hygroma is a predictive radiographic sign of hydrocephalus in patients undergoing DC. Hemorrhagic collections with mass effect are usually extra-axial collections, and are usually located at some distance from the craniectomy. Its etiology can be explained by the sudden decrease in intracranial pressure, so they rapidly appear. It is a rare complication, but it significantly increases the morbidity. Cerebral herniation usually appears during the first week after surgery. Its incidence is up to 25% and it is caused due to edema induced by cerebral high perfusion and due to the increase of the hydrostatic gradient from the capillaries, after decompression. When this complication occurs, it can generate brain parenchymal lacerations and can compromise the cortical venous flow against the edges of the bone defect, causing ischemia and necrosis. Performing a wide craniectomy minimizes this complication. The DC is also a risk factor for the development of hydrocephalus in up to 30% of cases, and can complicate the prognosis. Its appearance may be because this technique may induce alterations in the circulation of the cerebrospinal fluid (CSF). It is usually solved after placing the bone; however, it can persist for a long time despite the replacement. Sometimes, placement of a ventriculoperitoneal shunt is required. The impairment of cutaneous healing has an incidence of up to 10%. The surgical emergency of the procedure can damage the superficial temporal artery, and reduce flow to the flap, or also can accidentally open the frontal sinus, contaminating the area. The wound infection decreases its incidence due to the administration of antibiotics during surgery, which remains at around 7%. Moreover, the sealing of the dura prevents CSF leaks, which can cause meningitis. Replacing the bone is also associated with higher rates of infection, increasing when the bone flap is preserved for long periods of time under freezing conditions. In addition, it is a technique that is not free of complications, which themselves can further increase the worst prognosis of these patients. Just as more studies are needed to define the type of patient who can benefit from a DC, and to decide which technique is most appropriate, all the complications derived from this technique must be evaluated. 1. Aarabi B, Hesdorffer DC, Ahn ES, Aresco C, S'calea TM, Eisenberg HM. Decompressive craniectomy for Outcome Following malignant swelling due to severe head injury. J Neurosurg 2006;104:469-79. 2. Lubillo S, Blanco J, López P, Molina I, Dominguez J, Carreira L, et al. The role of decompressive craniectomy in the neurocritical patient. Intensive Care Med 2009;33:74-83. 3. Flint AC, Manley GT, Gean AD, Hemphill JC, Rosenthal G. Post-operative expansion of after-sided contusions hemorrhagic decompressive hemicraniectomy in severe traumatic brain injury. J Neurotrauma 2008;2:503-12. 4. Cooper DJ, Rosenfeld JV, Murray L, Arabi YM, Davies AR, D'Urso P, et al. Decompressive craniectomy in diffuse traumatic brain injury. N Engl J Med 2011;364:1493-502. 5. Lubillo S, Blanco J, López P, Dominguez J, Ruiz R, Molina J, et al. Decompressive craniectomy Does Improve ICP Beside other parameters? Effects of the decompressive craniectomy on tissue pressure? Intensive Care Med 2011;35:166-9. 6. Ban SP, Son YJ, Yang HJ, Chung YS, Lee SH, Han DH. Analysis of complications following decompressive craniectomy for traumatic Brain injury. J Korean Neurosurg Soc 2010;48:244-50. 7. Jiang JY, Xu W, Li WP, Xu WH, Zhang J, Bao YH, et al. Efficacy of standard trauma craniectomy for refractory intracranial hypertension with severe traumatic brain injury: A multicenter, prospective, randomized controlled study. J Neurotrauma 2005;22:623-8. 8. Huang X, Wen L. Technical Considerations in decompressive craniectomy in the Treatment of traumatic brain injury. Int J Med Sci 2010;7:385-90. 9. Qiu W, Guo C, Chen HO, Chen KE, Wen L, Huang H, et al. Decompressive craniectomy Effects of unilateral Patients with unilateral acute on post-traumatic brain swelling after-severe traumatic brain injury. Crit Care 2009;13:R185. 10. Yang XF, Wen L, Shen F, Li G, Lou R, Liu WG, et al. Surgical decompressive craniectomy to secondary Complications in Patients With A head injury: A series of 108 consecutive cases. Acta Neurochir (Wien) 2008;150:1241-7. 11. Paredes I, Cicuendez M, Delgado MA, Martinez-Perez R, Munarriz PM, Lagares A. Normal pressure subdural hygroma with mass effect as a complication of decompressive craniectomy. Surg Neurol Int 2011;2:88. 12. Schirmer CM, Ackil AA Jr, Malek AM. Decompressive Craniectomy. Neurocrit Care 2008;8:456-70. 13. Stiver SI. Complications of Decompressive craniectomy for traumatic brain injury. Neurosurg Focus 2009;26:E7. 14. Citerio G, Peter JD. Refractory elevated intracranial pressure: Intensivist's role in solving the dilemma of decompressive craniectomy. Intensive Care Med 2007;33:45-8. 15. Maloney-Wilensky E, Gracias V, Itkin A, Hoffman K, Bloom S, Yang W, et al. Brain tissue oxygen and outcome after severe traumatic brain injury: A systematic review. Crit Care Med 2009;37:2057-63.